Releasing the Magic! : DON VALLEY ACADEMY AMBASSADORS START THEIR JOURNEY TOWARDS THE WORLD OF WORK!! DON VALLEY ACADEMY AMBASSADORS START THEIR JOURNEY TOWARDS THE WORLD OF WORK!! I was really pleased to be back at Don Valley Academy today working with Richard Brooke, the academy principal, and Patrick Morris, who had managed to get a fantastic group of students to apply to become Don Valley Academy's first 'Better Learners, Better Workers' ambassadors! It was great to interview some of Richard's wonderful young people and see, once again, Patrick's enthusiasm and his commitment for his students. 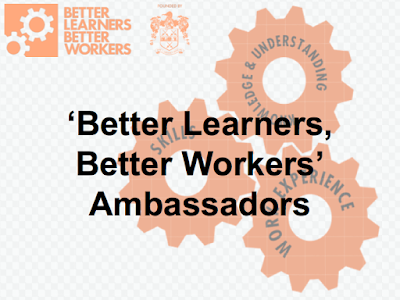 Patrick and Richard had shortlisted a great group for us to interview and we selected a fantastic group of young people to be Don Valley Academy's first BLBW Ambassadors. I am looking forward to working with these young people and seeing them grow and develop as talented and extraordinary young people ready for the world of work!